Family dinners can be a real chore especially when you're trying to hold down a job, running around after the kids and doing your daily tasks. Sometimes you just don't have the time to prepare a decent meal from scratch and end up resorting to takeaways or ready meals, all of which are expensive and not so healthy. I recently discovered that you can throw together a tasty, cheap, quick and easy family meal with a good ole tin of corned beef. These meals all take less than half an hour to prepare, some just 10 minutes, and around half an hour cooking time, so will be on the table within an hour which is about the same amount of time it would take to cook a ready meal or get a takeaway. A normal sized tin of corned beef costs around £1.30 but recently my local Spar had tins on offer for £1, needless to say I stocked up! It's always worth having a couple of tins in your kitchen cupboard as it's a cheap substitute for minced beef although perhaps not as healthy. There may also be times when you really fancy something with minced beef but you haven't got time to go to the shops or you forgot to get it out of the freezer. TIP Before you prepare any of these meals, put your tin of corned beef in the freezer for 15 minutes so it's easier to slice up! 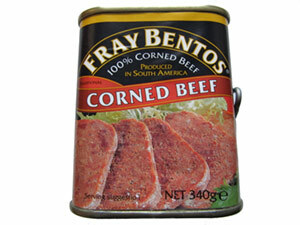 Have you got a corned beef recipe you'd like to share, if so please submit it to us.